This collection was accessioned by the University Archives in four pieces: accessions 1971:26 and 1981:28 from Van Pelt Library, and accessions 1982:62 and 1988:01 from George Wharton Pepper III. The Van Pelt holdings had been acquired from George Wharton Pepper, sr., and his estate in five installments from 1955 to 1963. This collection documents George Wharton Pepper’s political and legal careers and his involvement in the University of Pennsylvania Alumni Society and religious organizations. It also includes biographical materials, awards and citations, and genealogical materials. The personal records of George Wharton Pepper are sorted into seven series: biographical manuscripts, correspondence, speeches, writings and publications, subjects, artifacts, and certificates, awards, and honors. • The biographical manuscripts series have been kept as Charles J. Reinhardt originally arranged them, into 21 books, which are roughly in chronological order. • The correspondence series is divided into three sub-series: by date, by subject, and by correspondent. With the exception of the correspondence sub-series arranged by date, each sub-series is arranged alphabetically between folders. • The speeches series is arranged chronologically. • The writings and publications series is arranged chronologically by year and alphabetically within each year. • The subjects series includes the following sub-series: political issues, law practice and legal issues, religious matters, miscellaneous, family materials, University of Pennsylvania, and senate campaigns. Within this subject series, the politics, law, religion, miscellaneous, family materials, and University of Pennsylvania sub-series are arranged alphabetically according to topic. The senate campaigns sub-series is divided between the 1922 and the 1926 campaigns and arranged alphabetically within each of those two years. • The artifacts series are arranged alphabetically by type of artifact. 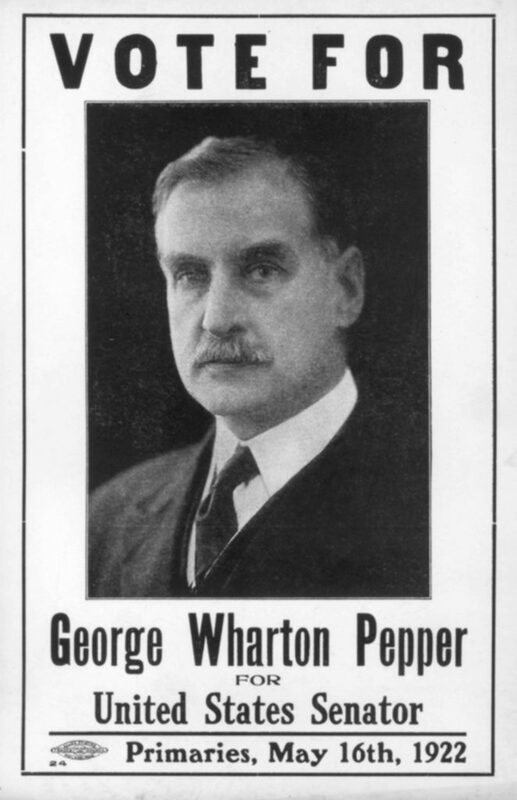 George Wharton Pepper – distinguished Philadelphia lawyer and U.S. Senator from Pennsylvania – was born in Philadelphia on March 16, 1867 to George Pepper, a physician, and Hitty Markoe Wharton. His parents were descendents of two old and socially prominent Philadelphia families. Pepper’s birthplace and first residence, 1215 Walnut Street, evidences the extent of his family’s wealth; at the time, an address on Walnut Street was a statement of financial and social success. In 1883, with his eyesight vastly improved, Pepper entered the University of Pennsylvania, where he became an extremely active participant in athletics, drama, and student government. According to the 1887 Record, Pepper was class president the first term of his freshman year. He was a member of the Record committee and involved in a number of social organizations. He participated in a wide variety of sports, ranging from crew to football, cricket, and baseball. Most notably, he was a four-year member of the football team and captain of the same for three of his four years. He was editor-in-chief of both the student newspaper, The Pennsylvanian, and a student literary magazine, the University Magazine, before the two merged to become the Daily Pennsylvanian. Additionally, Pepper was a member of Philo and played the part of Dikaiopolis in the College’s production of The Acharnians, a Greek play by Aristophanes. At the conclusion of his senior year, Pepper was named Spoon Man, the first of four honor awards given during Hey Day to senior men. Pepper received his Bachelors of Arts in 1887, graduating first in his class. Over the next twenty years, Pepper developed an increasingly successful private law practice while also teaching at the University of Pennsylvania and editing and writing legal reference works. After four years as a teaching fellow at Penn, he became the Algernon Sydney Biddle Professor of Law in 1893, a position that he held until 1910. In 1907 he received an honorary degree from Penn. 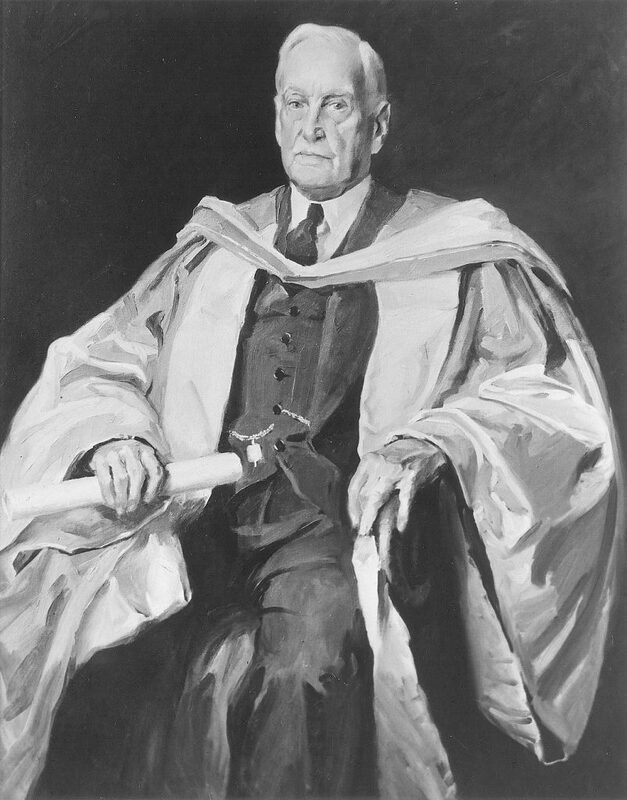 Following his retirement from teaching, which was a result of his expanding private practice, Pepper became a trustee of the University from 1911 until his death in 1961. Pepper’s publications while at Penn were both practical and scholarly. He compiled, in collaboration with William Draper Lewis, the massive Digest of Decisions and Encyclopedia of Pennsylvania Law, 1754 – 1898 (1898 – 1906). In addition, he authored The Way: A Devotional Book for Boys (1909), A Voice from the Crowd (1915), and Men and Issues (1924). For several years, Pepper also served as the editor of the American Law Register and Review. Pepper lost the 1926 Republican senatorial primary, an election he had expected to win. In what turned into an expensive and vicious campaign, Philadelphia “boss” William S. Vare triumphed in a three-way race that also included Governor Gifford Pinchot. Although Pepper carried sixty-two of Pennsylvania’s sixty-eight counties, he could not overcome the political influence of Vare in his home city of Philadelphia. Running on an anti-prohibition platform, Vare’s successfully clinched the Republican nomination but was immediately criticized for campaign fraud. The U.S. Senate opened an investigation into Vare’s campaign expenses and possible false ballots, and, after Vare’s victory in the general election, continued to look into charges of corruption. In 1929, Vare was barred from taking his Senate seat because of excessive campaign expenditures; the newly-elected Governor John Fisher appointed Joseph Grundy, one of his strongest supporters, to fill the vacancy. In his post-Senate career, Pepper published five books: The Way; a devotional book for boys (1909), In the Senate (1930), Family Quarrels (1931), Philadelphia Lawyer (1944), and Analytical Index to the Book of Common Prayer (1948). His autobiography, Philadelphia Lawyer, was hailed by critics as one of the best literary achievements of the year. It serves both as a memoir of his life and as an informal history of United States and Pennsylvania history in the early twentieth century. Pepper died on May 24, 1961 at the age of 94 at his home, Hill House, in suburban Devon, PA. He left a legacy as a distinguished lawyer and politician and one of Philadelphia’s greatest sons. The biographical manuscripts series contains typed rough drafts of material collected by Charles J. Reinhardt for his planned biography of Pepper’s life up to 1933. Reinhardt, a former Bulletin staff member and later Senator Pepper’s legislative secretary in Washington, D.C., originally organized the manuscripts into binders that were arranged into 21 books and housed in 8 boxes. For most of the material, Reinhardt wrote introductions and table of contents explaining the documents. Books 1 and 2 contain narratives of Pepper’s life written by Reinhardt, covering Pepper’s ancestry, boyhood, early education, and life until 1933. These two books also include background history of both Philadelphia and the nation during that period. Reinhardt originally positioned an index of books 3 to 17 at the beginning of Book 3. Books 3 to 17 document anecdotes, speeches, articles, programs, and pamphlets from throughout Pepper’s life. The books are in narrative form and include original documents that relate to every activity. Reinhardt separated the material into four major time periods: 1900 – 1910; 1910 – 1915; 1915 – 1920; 1920 – 1932. The bulk of the material lies within the last seventeen years, 1915 – 1932. The arrangement of the books is unclear; Reinhardt seems to have arbitrarily divided the material into books, which are not arranged by chronology or by subject matter. The material does seem to be roughly grouped by Pepper’s involvement in various political, social, and religious organizations, committees, or projects. Book 18 contains summaries of Philadelphia and national history and political events from 1867 to 1932. Reinhardt compiled the material to assist Pepper in writing his autobiography. Book 19 consists of several folders of additional material, including speeches, programs of official dinners, newspaper clippings, and political cartoons compiled by Reinhardt for possible inclusion in Pepper’s autobiography. Book 20 contains four drafts of narratives of political religious and social anecdotes relating to Pepper’s career. Reinhardt wrote the drafts for publication either as stand-alone articles or chapters in Pepper’s autobiography. Book 21 contains campaign materials – speeches, addresses, pamphlets, newspaper clippings – pertaining to the 1932 presidential election and the Republican Party’s endorsement of Hoover. The original chronological arrangement of this series was changed during processing. The correspondence series is now divided into four sub-series: by date, by subject, and by correspondent. The sub-series arranged by date contains general correspondence that covers a broad range of political, religious, and cultural topics. This sub-series is the smallest in volume. The sub-series organized by subject is arranged alphabetically between folders and chronologically within each folder. The sub-series consists of correspondence relating to a specific topic or event. Most of the topics relate to Pepper’s involvement in Pennsylvania and national politics and his connection to the Episcopal Church. This sub-series contains close to half of the material in the correspondence series. The sub-series organized by correspondent is arranged alphabetically between folders and chronologically within each folder. The series consists of correspondence between Pepper and a single individual or married couple that spans from one to thirty-two years. Topics that appear frequently in this sub-series include Pepper’s legal activities, his political views regarding local, national, and international affairs, his involvement with the Episcopal Church, and his many speaking engagements. Some of the material relates to Pepper’s personal life, although the bulk of the correspondence pertains to his professional activities. Coupled with the sub-series arranged by subject, this sub-series comprises the majority of the correspondence collection. All correspondence sub-series contain newspaper clippings, pamphlets, speeches, invitations, and reports that relate to content in the correspondence. The speeches series is arranged chronologically. Some of the folders do not contain copies of Pepper’s speeches but instead include only supplementary material relating to the given address. Among the folders that do contain copies of the designated speech, most also contain related documents and objects, including correspondence relating to the address, hand-written drafts, research notes, newspaper clippings, programs, invitations, seating arrangements, note cards, and memorabilia from the event. Topics that appear frequently in Pepper’s speeches include the U.S. involvement in the First World War, the National Preparedness movement, the League of Nations, the role of the Episcopal Church, and the Republican Party. Also included is material pertaining to the Lyman Beecher lectures that Pepper gave at Yale University in 1915. The writings and publications series are arranged chronologically by year and alphabetically within each year. These include articles, book reviews, memorials, introductions to books, statements, responses, and commentary published or written for publication. Most folders contain typed drafts, correspondence relating to the publication, and copies of the designated article. Some folders also contain clippings and hand-written notes. Pepper made frequent contributions to the Saturday Evening Post, the American Bar Association Journal, The Shingle, and various daily newspapers. Also included is a scrapbook containing reviews and clippings relating to Philadelphia Lawyer. The original arrangement of this series was changed during processing. The subject series is now divided into four sub-series: political issues, law practice and legal issues, religious matters, senate campaigns, the University of Pennsylvania, family materials, and miscellaneous. The folder contents in this series varies and may include related correspondence, drafts, memos, notes, clippings, photographs, and printed matter. The political issues sub-series contains materials relating to Pepper’s career as a politician and are arranged alphabetically by topic. Within each topic folders are arranged alphabetically according to the folder’s contents. Topics that appear frequently include Codification and Revision of Laws, The Citizens Committee for Reorganization of the Executive Branch of Government (The Hoover Commission), the Neutrality Act of 1939, and the Permanent Court of International Justice (World Court). The law practice and legal issues sub-series contains materials relating to Pepper’s career as a lawyer and are arranged alphabetically by topic. Within each topic folders are arranged alphabetically according to the folder’s contents. Topics that appear frequently include The Bricker Amendment, and Declaration on Segregation, “Recent Attacks upon the Supreme Court of the United States: A Statement by Members of the Bar”. The religious matters sub-series contains materials relating to Pepper’s religious activities arranged alphabetically by topic. Within each topic folders are arranged alphabetically according to the folder’s contents. Materials relating to the Stonemen’s Fellowship, and the National Cathedral make up the greater part of this sub-series. Also included is a scrapbook of Episcopal Church affairs of 1906-1907. The miscellaneous sub-series contains folders that were originally kept together and unfit for the politics, law, or religion sub-series and is arranged alphabetically by topic. It contains preparatory materials for speeches, reprints of speeches, works by others, and materials relating to Pepper’s father, George Pepper. The senate campaigns sub-series includes correspondence, drafts, clippings, and printed matter and is arranged alphabetically between materials relating to the 1922 senatorial appointment and election campaign, and the 1926 re-election campaign. Most of this sub-series consists of congratulatory letters following Pepper’s appointment to the senate and his subsequent senatorial special election campaign. Also included are materials related to immediate issues he was facing in 1922, namely the coal strike and, the national railway shopmen’s strike. The bulk of this series is correspondence, but it also includes drafts, memos, clippings, various printed matter, and campaign memorabilia. Also included is a flag presented to Pepper upon his appointment to the senate; a scrapbook of clippings and a scrapbook of photos, letters, and memorabilia from the 1922 senatorial election campaign; and a scrapbook of clippings and a scrapbook of correspondence from the 1926 senatorial election. The University of Pennsylvania sub-series is arranged alphabetically by topic or organization and consists of materials relating to Pepper’s various roles at the University of Pennsylvania. Included are materials related to the Committee on Honorary Degrees, the Committee of Seven to resurvey the administrative organization in 1944, the General Alumni Society, Pepper’s trusteeship from 1911-1961, the Development Fund from 1947-1956, and the University of Pennsylvania Fund from 1924-1948. The family materials sub-series is arranged alphabetically and includes a prayer book and guest book from Pepper’s 50th Wedding Anniversary, genealogy data, and the gust book and photographs from the Pepper family reunion of October 19th, 1947. Also included is correspondence with various family members including correspondence with Pepper’s sister-in-law, Mary DePree of Sussex, the wife of Major General DePree who was being held as a prisoner of war in Germany during World War II, Family Letters of 1834-1941 compiled by George Wharton Pepper, large genealogy charts, and Some notes on the early family history of the Peppers of Philadelphia with genealogical charts by William Carleton Watts, July 1948. The artifacts series is arranged alphabetically. In the artifacts series, the number under the folder column in the database refers to the item number. Most of these items are medals awarded to Pepper. Also included are gavels, trophy cups, two sets of drawings and poems by Pepper for the Farmers’ Club, the Pepper spoon, and academic regalia. This series consists of a scrapbook containing diplomas, diplomas for honorary degrees, commendations, military service certificates, college report cards; certificates to practice law in municipal, state, and federal district courts including supreme courts; membership certificates for learned societies, appointments to federal commissions, and George Pepper (1840-1872) diplomas. United States. Commission on Organization of the Executive Branch of the Government (1947-1949). University of Pennsylvania. Law School. Biddle, Anthony J. Drexel, (Anthony Joseph Drexel), 1874-1948. 1917, Jan. 26: Address, delivered at Congress of Constructive Patriotism, National Security League, Washington, D.C.
1923, Jan. 15: Address, delivered before Anti-Saloon League, Washington, D.C.
1923, May 25: “Faith and social service,” delivered before the Social Service Workers of the Protestant Episcopal Church, Washington, D.C.
1923, Sept. 30: “The nation and the church,” delivered at the National Cathedral, Washington, D.C.
1923, Dec. 11: Address, delivered before Republican National Committee, Washington, D.C.
1924, May 18: Address presenting National Service Flag to Washington Cathedral, delivered on behalf of the Brotherhood of St. Andrew, Washington, D.C.
1924, June 3: Radio address on Senate resolution to adhere to the Permanent Court of International Justice, Washington, D.C.
1925, Oct. 12: Address, delivered before York County Bankers’ Assn. 1926, Feb. 1: Address, delivered before deliver the Order of the Sons of Italy of the District of Columbia, Washington, D.C.
1926, Feb. 22: “Foundation stones of finance,” delivered before Bucks County Bankers’ Assn. 1926, Mar. 6: “The teacher and the legislator,” delivered before the PA State Teachers’ Assn. 1926, Apr. 12: Radio address on voter registration, delivered in Washington, D.C.
1926, Apr. 20: Address, delivered before the Pennsylvania D.A.R., Washington, D.C.
1927, June 24: Address, delivered before PA Bar Assn. 1928, Feb. 15: Address on the General (Church) Convention, delivered in Washington, D.C.
1928, May 17: Address, delivered before the National Cathedral Assn. 1928, Oct. 7: “Witnessing for Christ,” delivered at Brotherhood of St. Andrew National Convention, Washington, D.C.
1929, Feb. 5: Address, delivered at dinner in honor of Bishop of Washington, Washington, D.C.
1929, June 2: Address, delivered at St. Alban’s School, Washington, D.C.
1929, Nov. 21: “Substantially correct,” delivered before Chicago Bar Assn. 1930, Mar. 6: “The wooden horse,” radio address sponsored by the D.A.R. 1930, May 16: Address, delivered at dedication of the Pilgrim Steps, Washington Cathedral, Washington, D.C.
1930, May 30: Address, delivered before the American Law Institute, Washington, D.C.
1931, June 4: Address, delivered at Boys’ Club Federation dinner, Washington, D.C.
1932, Jan. 23: “What breed of dog is the lawyer?” delivered before New York State Bar Assn. 1932, Feb. 22: Address, delivered following Corporate Communion Service, Church of the Epiphany, Washington, D.C.
1933, Nov. 13: Schrafft’s radio address, interview by Lucy Grey Black of G.W.P. 1934, May 10: Address, delivered at opening of the Dept. of Justice Building, Washington, D.C.
1934: Dec. 20: Address in honor of John Marshall Gest, delivered before the Philadelphia Bar Assn. 1936, Feb. 1: Address, delivered before the Federal Schoolmen’s Club, Raleigh Hotel, Washington, D.C.
1936, Apr. 2: Address in honor of William H. Kingsley, delivered before the Penn Mutual Life Insurance Co.
1936, Apr. 16: “The evolution of the Book of Common Prayer,” delivered before Men’s Club, St. John’s Parish, Washington, D.C.
1938, May 19: Radio address, delivered at the opening of the new NBC-KYW building, 1619-21 Walnut St.
1940, Oct. 24: “Where do we go from here?”, delivered before Assn. of National Advertisers, White Sulphur Springs, W. Va.
1940, Oct. 29: Campaign address, delivered in Washington, D.C.
1941, Oct. 22: Address, delivered at the installation of the Presiding Bishop, Synod of the 3rd Province, Washington, D.C.
1942, Jan. 28: Address, delivered before Boston Chapter, National Cathedral Assn. 1942, Mar. 16: Memorial address for Justice Willis Van Devanter, US Supreme Court Building, Washington, D.C.
1942, Oct. 23: Address, delivered before the National Republican Finance Committee, Washington, D.C.
1943, Nov. 4: Address, delivered at dedication of Emergency Aid of Pennsylvania building, 1629 Locust St.
1944, Mar. 17: Address, delivered before Women’s Washington Cathedral Committee, Sulgrave Club, Washington, D.C.
1947, Nov. 12: Addresses in honor of Justices James Clark McReynolds and Harlan Fiske Stone, delivered at Supreme Court Memorial tribute, Washington, D.C.
1956, June 5: Address, delivered before the Philadelphia Bar Assn. Judge Thayer, delivered before Bar Assn. 1948: “Analytical Index to the Book of Common Prayer”, published by the John C. Winston Co.
“League of Nations Primer”, published by the League for the Preservation of American Independence, n.d.
“Our Advantage of Position”, newspaper clipping, n.d. Suggested Substitute for Art. 14, n.d.
“Questions on Church History” notebook, n.d. Various material for speeches prepared by Charles G. Reinhardt, includes “They Also Serve” by G.W.P. William H. Drayton to Francis Wharton, 1860s? W.D. Reed to George Mifflin Wharton, n.d.
Frances (Pepper) Scott, 1930, n.d.
Pepper, Rebecca Willing, 1938-1940, n.d.